LEDs do not have the same spectrum as sunlight does. Three volt superbright LEDs have relatively low lumens. Working in a 10cm x 11xm x 11cm box doesn’t give me a lot of space to move and fit in the various apparatus. First step, I ordered a small glass prism from a kids’ science online supply store (the smallest I can get). Then I played around with some superbright white LEDs. I read around online to see how people have replicated the experiments. Most people recommend using sunlight and there is some discussions about the limited range produced by a LED (the attempt to replicate sunlight in artificial lighting is fascinating). There is a recommendation to put a slit in front of the light source to produce a beam. This seems to help produce a rainbow (although quite thin). I also have the idea that the prism should move so the rainbow can come and go. So I started to test out different motors. I decided to try a stepper motor first as I was under the impression that you can have much more control with the speed, directions, and pauses using the arduino. Here’s a simple test. It’s quite powerful, quite noisy, and gets very hot. And thought maybe not. Then I watched this video on Sparkfun that tells you about the difference between a stepper motor and a servo. I found a small servo Redmond bought a while ago and connected it to an arduino. Simply fiddling with the code gives me exactly the slow speed I am after. Building a makeshift platform on the arm of the servo, I carefully placed the glass prism on top. The rainbow is thin but clearly visible. I have also decided to add a simple background. Below is Newton’s sketch of his experiment when he split and recombined white light. This background is Newton’s sketch of the set-up in his room. 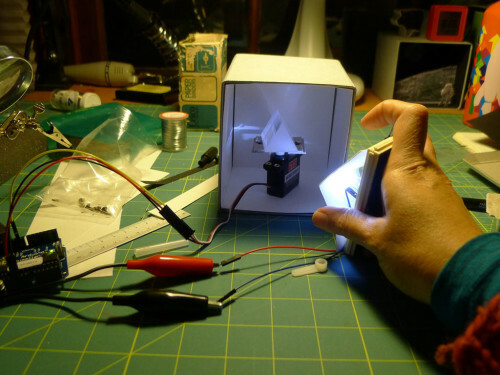 The set-up uses 3 superbright white LED shinning through a slit (this is what my hand is doing in the photograph below). It all works in principle but the challenge will be staging it in the small dimension of the box. It will also require securing the servo so it doesn’t topple over. I have ordered a even smaller servo (by about 1 cm in height). 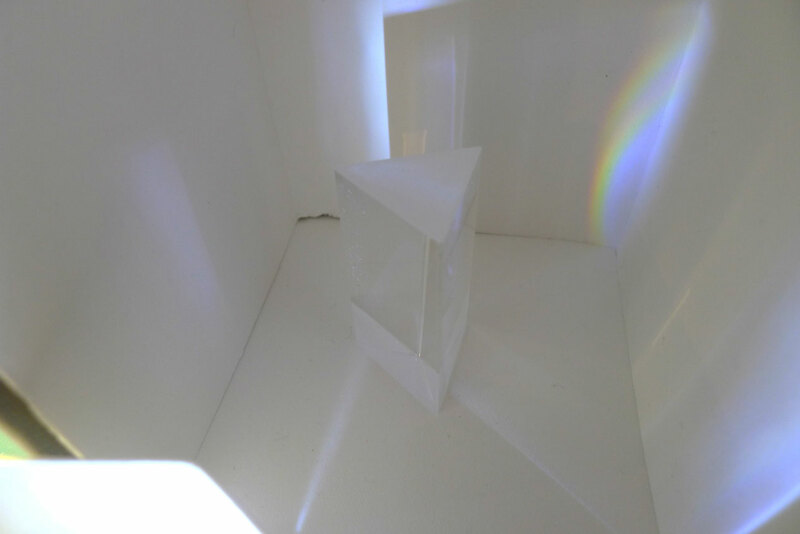 Will the light source from inside the box be too close to produce a rainbow? Then there is the wiring to worry about.